The next Formula 1 season will get underway on 15th March 2015 in Melbourne Australia with the traditional first grand prix of the season and we already have some shake ups in how the drivers and teams will lineup heading into the 2015 season. On this page you will find all the information about team by team lineup of drivers. The provisional F1 2015 lineup will have 9 teams and 18 main drivers and the list of whole main drivers of all 9 teams is listed below. 4time world champion Sebastian Vettel left Red Bull to join Ferrari. Fernando Alonso left Ferrari and joined McLaren where he will be driving alongside vatern Janson Button. 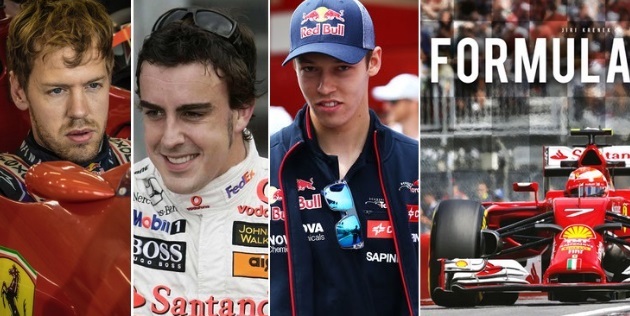 Young driver Kvyat left his Torro Rosso and joined Red Bull where he will take the seat left by Vettel. Nasr was the reserved driver for Williams in previous season and in 2015 he will drive for Sauber.